Can your child learn to read in a fun, non-stressful and hands-on way? The answer is, YES! You can not only help your child learn to read through lots of play, hands-on activities and of course daily exposure to books but you can help them become lifelong readers as well. A is for Alphabet. Learning to read starts with the basics - letter recognition. This can start as early as your child shows interest and can be both fun and developmentally appropriate. Here are 90+ Fun Ideas for Teaching Kids Letters compiled from bloggers around the web from Learn with Play at Home. 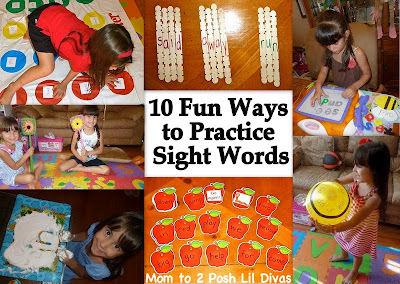 No Time for Flashcards has tons of great Alphabet Activities for kids. For even more ideas check out my post filled with Tactile Alphabet Ideas and my Alphabet Fun and ABC Letter Craft Ideas boards on Pinterest. B is for Books, books & more books. There is no better way to teach a child to read than to expose them to books and reading on a daily basis. Reading to a child from early on not only helps develop a love of literacy but it gives them a foundation on which to build later reading skills. Regular exposure to age-appropriate books and the printed word in general allows children to develop literacy skills that are crucial to learning how to read such as the ability to interpret pictures, to follow the plot of a story and to associate meaning with the printed word. For some children's book recommendations and correlating activities check out my Children's Book Week Linky with links to 100+ Children's Book ideas & activities and Toddler Approved's Children's Book Related Crafts and Activities Board on Pinterest. C is for Comprehension. A crucial part of learning to read is comprehension. This can be done easily by asking children questions as your read together. They do not need to be difficult questions but they should offer insight into what has been read. Think of simple questions that answer the key who, what, when, where, why and how details of the story. 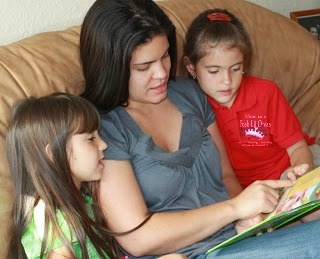 The ability to stop, think and analyze the story will really help your child when they are reading independently. Coffee Cups and Crayons uses a Question Ball as a fun way to help aid her children's reading comprehension. 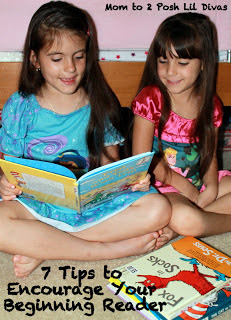 Imagination Soup has some great tips on Reading Comprehension Strategies. D is for Developmental Readiness. Exposing children to books, letters, words and a literacy rich environment is quite beneficial. It is important however, not to force young children to "learn to read" before they have expressed interest or are developmentally ready for such tasks. Instead, it is important to provide positive and fun experiences where children can be engaged with letters, sounds, words and books that are developmentally appropriate. For example, you shouldn't expect your 3 year old to read Harry Potter but they may be able to help you "read" some of the key words in some of their favorite bedtime stories like Goodnight Moon. Keep it light, fun and simple. It will all come together in time. Here is a great post highlighting 4 Signs Your Child is Ready to Read by Playdough to Plato. E is for Encouragement. We all need it, don't we? It is easy to get frustrated when teaching a child to read. We tend to forget that we too, once (probably) struggled with learning to read since we have been at it for so long. Instead of being upset or frustrated, try to remain calm and encouraging. The more positive an environment we provide the better the child will feel. The last thing you want to do is to give your child a negative view of books and reading based on how you are interacting with them as you read. 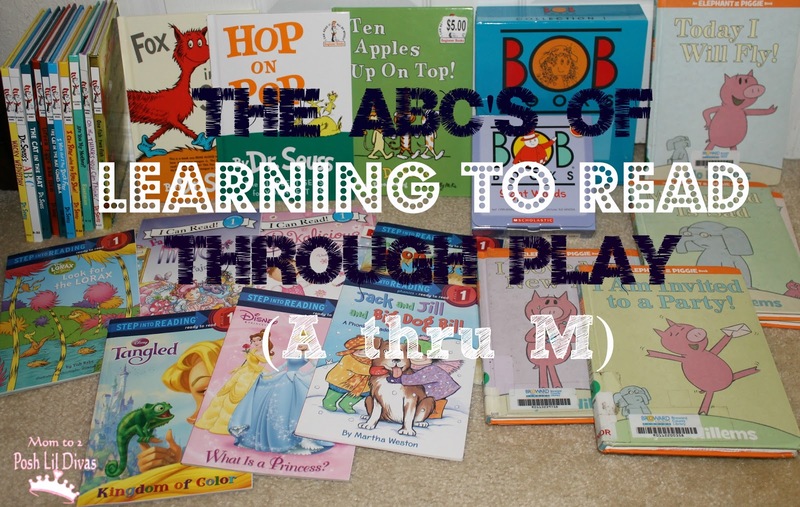 I wrote a post with 7 Tips to Encourage the Beginning Reader that I hope will help you keep things upbeat and encouraging as you work with your child on learning to read. F is for Fluency. Fluency comes with time and practice. Beginning readers spend quite a bit of time reading letter by letter and then word by word. This is normal. The more familiar they become with words by sight, the less choppy and more fluent their reading will become. Working on sight words, phonics skills and spending lots of time engaged in reading will help your child become a more fluent reader. G is for Games. Both my girls learned how to read by playing games. Yes, you read that correctly - games. We started with Alphabet Games like this Musical Alphabet Game to review letter recognition and practice their sounds. Once they knew their letter sounds we moved on to Phonics Fun and Sight Word Games. H is for Hands-on. Learning to read doesn't mean you always have to sit, stuck behind a book. Get moving, doing and playing and you will see how enthusiastic your child can be about learning to read. Looking for a few more fun ways to practice sight words - how about Sight Word Twister or Sight Word Hopscotch. Those are 2 fun ways we regularly play to learn. The girls are moving and playing and hardly realize they are also doing some learning in the process. I is for Interests. 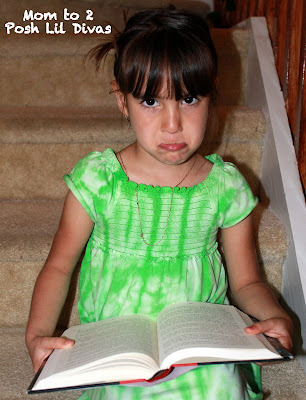 You would be surprised at what the wrong book can do to turn a child off of reading. If you want to get your child reading - take their interests into account. If you have a child who enjoys playing sports try some books centered around this topic or read non-fiction books on some of their favorite athletes. Have a child who enjoys a good joke? Read a few joke books. They may be silly but they will have them reading to tell you jokes and laughing along the way. Finding the "right" book which captures your child's interest can turn them on to reading and help them on their way to being lifelong readers. J is for Journal. Encourage your child to keep a journal and write in it daily. You will be amazed at how their writing and spelling improves as they learn to read. The simple act of sounding out words while they write is wonderful reading practice. Fight the temptation to "help" them with spelling and grammar. Let the journal be their special place to freely express their thoughts and they will be more receptive to using it. Once it feels too much like another piece of homework where they have to worry about handwriting, spelling and grammar - they will be far less excited about it. K is for Keeping Your Cool. I'm embarrassed to say that I have lost my cool way more than I care to admit with the whole "learning to read" process with the Lil Divas. As an educator, I know better. As a mom, these particular mom fails rank high on my list of moments I wish I could do over. So take it from someone who has been there - keeping your cool is important. The last thing you want is for your child is to think you are angry with them or worse, disappointed in them. When things get frustrating, take a break. 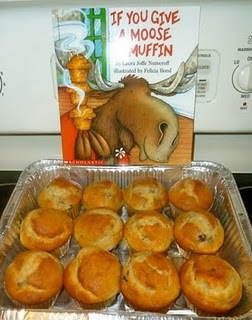 Stop and have a snack or just do something else and come back to reading with your child when you are feeling ready to tackle it again. You will both benefit from it. L is for Letter Sounds. It sounds pretty basic, doesn't it but you'd be surprised by how many students I have come across over the years that lacked this important foundation. You can have lots of fun with letter sounds. When the Lil Divas were younger they were hooked on Leapfrog videos. I credit LeapFrog:Letter Factory with them learning their letter sounds not only quickly but so well. Fast forward to today, 3 yrs later, and the Littlest Diva can still sing the songs for almost every letter. Want more active learning fun? Try playing Letter Sounds Hopscotch from Childhood Beckons. M is for Modeling. One of the best way to teach a child to read is to model how it's done. Read with your child daily, placing emphasis on following punctuation, reading with expression and even using different voices. Not only will you capture their attention and interest but you will be modeling good reading practices for them to follow. I love reading with the Oldest Diva. She is such an expressive reader which makes us really enjoy the books we read together. Stay tuned tomorrow for the rest of this series featuring letters N-Z with lots more information that I hope you will find useful as you help your children along on their reading journey! 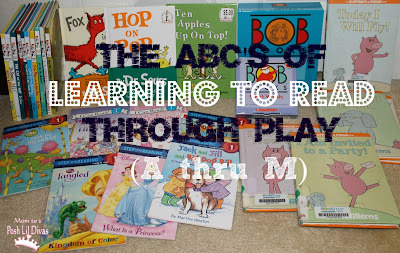 If you want to check out ALL of the fabulous ABC's of... posts be sure to stop by Reading Mama for all the info and links. There are so many wonderful topics being covered including arts & crafts, learning through play, literacy & language, Mama tips & tricks and school activities. These are such important areas to think about whehn helping your child learn to read. Great reminders of what to focus on to help get kids ready to read! Cdr Australia writers who do the job, correct them and give back a flawless report. You will need to compose three distinct career episodes, each dealing with a professional project or task handled by you as an engineering professional CDR report writers. This section must have a detailed account of your role and application of problem-solving techniques for those projects. Thanks for this informative content. It’s really good. Actually, I want to share some thoughts and reviews about an assignment help company in USA. We assist you with your assignment with complete precision and quality and share it within the deadline. Our Assignment help Australia services are always available 24*7 as per your needs. Students Assignment Help is the most trusted assignment help company providing supply chain management assignments to the students. Our experts handle complicated assignments outstandingly. Hire our authors now, email us at info@studentsassignmenthelp.com or WhatsApp: +44-7555-369-184. we provide best assignment help in Australia, USA and UK. allassignmenthelp.com is number 1 for assignment Help Services in USA. we offer best allassignmenthelp reviews in USA and Australia, AllAssignmenthelp is number 1 assignment help services in US, UK and Australia. Ireland Assignment Help offers the top Assignment help online Services to all college students around the world. Our skilled writers aid you in writing assignments at a low price. The students who are unable to spend enough time to complete their complicated assignments may hire Online Assignment Help writers. We have professional and experienced subject experts offering you the most favourable assignment help services and ensure quality solutions and delivery in time. As soon as we receive a request for Law essay help, our experts start with research that allows them to gather relevant information about the topic. At StudentsAssignmentHelp.com our experts are working with the best and high-qualified team of business law assignment help. The experts in our team have knowledge in various academic disciplines and these are as English, economics, history, management, IT, law, arts, nursing, hospitality, etc. So grab the best assignment offers today.